Featuring a Theme theme, this poster will be sized at 11 x 17, a bit larger than my 2012 poster efforts. The image will be screen printed on a Myrtle Blueberry paper (Flavours Gourmet) using Iridescent Silver (Fine) by Golden Acrylics, White, Yellow, and Sea-foam Green. Everything that appears as grey in the graphic will be printed with Metallic Silver. I am really looking forward to seeing how this turns out. Most likely there will be some variants available, but I am keeping those details under wraps for the time being. In order to help offset the cost of this run, I am opening these up for a pre-order period. There will be 30 of these available for pre-order at $20 shipped. They will be $20 even in the lot. The pre-order will stay open until ink hits paper, or until the 30 slots fill up, whichever comes first. 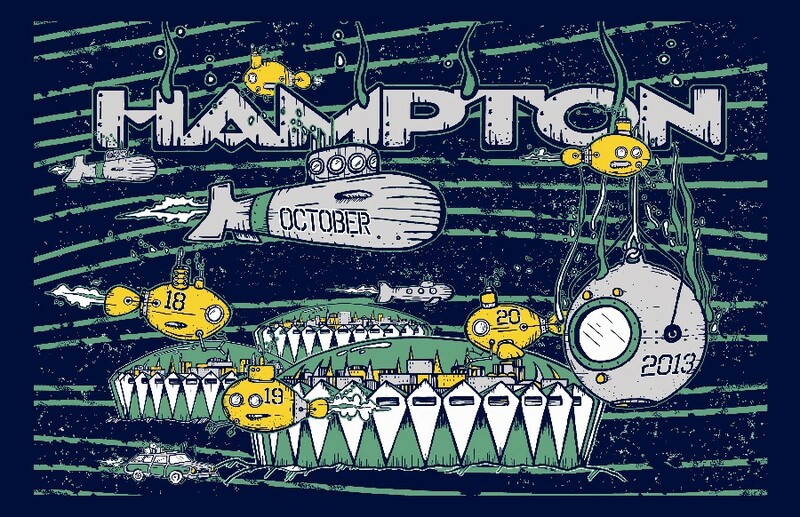 You should receive your poster before Hampton, so you won't even have to worry about carrying it around. After this period, you won't be able to get them online until after Fall Tour. Hey, I done did that preorder majiggy. Yea Jiggs, any plans to print the image onto shirts? It's kind of up in the air for shirts. I would really like to, but as soon as I finished the art on this one, I started on an Atlantic City print. Then I have an image to work on for a friend's band. Plus the format for a shirt would need to change a little bit. and THANK YOU for ordering.